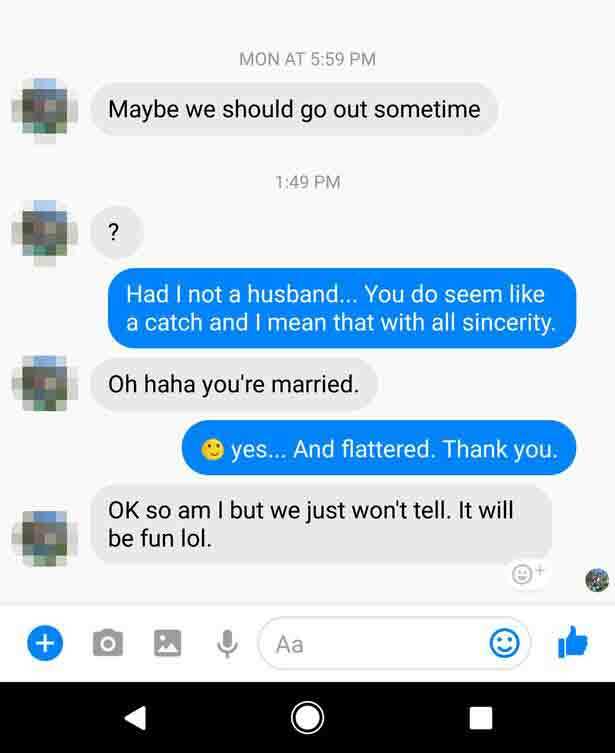 Being asked out by someone is many things. Exciting, flattering, uplifting - in theory a force for good. When it's someone who's married and you happen to be happily married, then it becomes a little murkier. Especially if they don't care you're happily married and have a blithe disregard for their own marital status. When this happened to one married woman, she initially issued a very polite refusal, explaining she was married. But when her admirer pushed his luck, she knew EXACTLY what to say. The man and woman had been enjoying a lively conversation about politics on Facebook, according to Bored Panda when the married man decided to try and up the ante. As replies go, hers is pretty amazing, dancing that fine and tricky line between being sincere and also really nice. Unfortunately for her admirer - whose profile picture seems to include one of his children - he went a little too far. So the woman had a response which is both heartwarming and ever-so-slightly brutal. "When I got diagnosed with cancer last year, I didn't have the heart to tell my boys (whom I have always protected) that I could die. 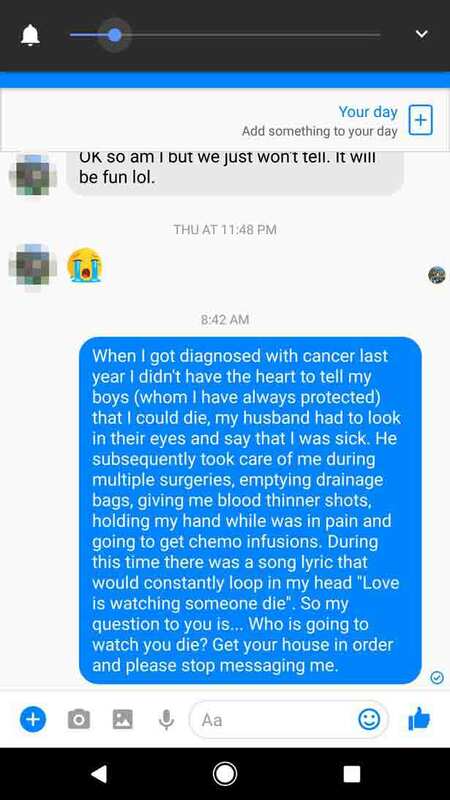 "My husband had to look in their eyes and say that I was sick. He subsequently took care of me during multiple surgeries, emptying drainage bags, giving me blood thinner shots, holding my and while I was in pain and going to get chemo infusions. "During this time there was a song lyric that would constantly loop in my head, "love is watching someone else die. "So my question to you is...Who is going to watch you die? "Get you house in order and stop messaging me." Let this be a lesson to all would-be loverats.